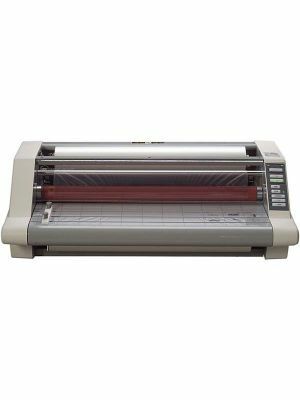 GBC Fusion 3000L 12" laminator is a high-efficiency laminating product ideal for professional use. 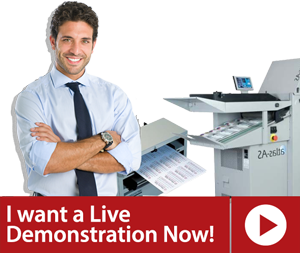 It features some of the best capabilities and innovative features that make laminating easier than ever. The GBC Fusion 3000L has exceptional speed of 19" per minute and also features a 12" throat that give customers a great deal of flexibility with the range of documents they can laminate. To complement this variety, GBC Fusion 3000L is built to work with 3 and 5 mils pouches. The machine settings for either pouch size can be easily done through a single touch using the touch control panel. Furthermore, a button is also included for cold mode, which can be used if the pouches are sensitive to heat. Fusion 3000L laminator has a quick warm-up time of just 90 seconds so no time is wasted in waiting. There is a green light signal, and a beep, to indicate that the warm-up has completed. 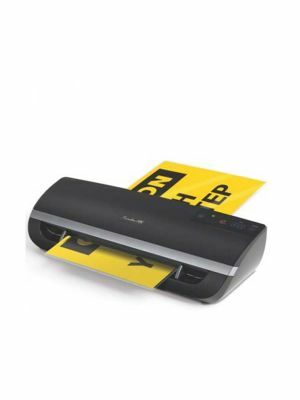 GBC 3000L 12" laminator also expertly handles paper jams because of its Jam Alert feature. This feature alerts users of the jam through a beep, who can then press the release button and manually take the jammed pouch out. GBC laminators are also highly designed to save power; there Intelligent™ Power off feature automatically turns them off if they are not in use from 30 minutes, drastically decreasing energy wastage. Q: For how long am I entitled to warranty? A: The GBC® Fusion™ 3000L 12" Laminator comes with a 1-year limited warranty. Q: What should be the thickness of the pouches for lamination? A: Select 3 or 5 mil thermal pouch thickness with the touch of a button for GBC 3000L. Q: Does the GBC Fusion 3000L 12" comes with a temperature control function? A: Unfortunately, GBC Fusion 3000L comes with fixed temperature settings. Q: How to utilize cold settings for ultra-smooth results? A: For smooth results, pressure sensitive pouches should be utilized.